Navratri is celebrated in different regions of India in different ways. .. In the North West – Esp in the state of Gujrat, Navaratri brings in Garba – or the Dandiya raas. A dance form depicting Lord Krishna’s dance with his gopikas.. Typically danced with 2 wooden dowels / sticks decorated in festive colours. At home too, we decided to decorate our dandiya sticks ..
We bought 2 wooden dowels / sticks from Itsy Bitsy. They cost 2 rs per inch..
Take the glitter tapes and twist around the sticks in a slant direction. We covered 1/3rd red, 1/3rd blue & 1/3rd Pink. Then we took silver sticker tape and make wide diagonal twists on it. Wasn’t that easy?? Here’s my lil Princess in her garba avatar ready to groove!! We also made a similar one with coloured paper & zari for my article for Women’s Web.. 4 Feastive crafts with your kids. Also check out our Diwali board on pinterest.. 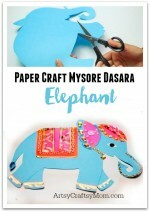 Follow Artsy Craftsy Mom’s board Diwali Crafts on Pinterest. 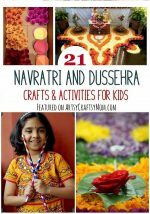 looks lovely and great idea of decorating dandia sticks with glitter tapes..and your kid looks superb in this attire..
Great idea Shruti – 11 days 11 crafts – looking forward to them all. I’ll simply redecorate their old dandiya sticks using your idea.